In the last week I have been out and about a bit more getting some time in the great outdoors. This has been aided by some new insect repellant that seems to be working so far. In the past week I have completed another bumble bee survey – better than last month but only half the number seen last year, spent a happy couple of hours just looking and photographing around Daventry, to be completed on Saturday with a WildSide recording sessions with the fab and enthusiastic Ryan Clark. 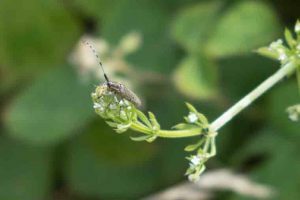 I’ve uploaded all of my sightings (or at least those that I can identify or have a semi-decent photo for) either onto iRecord or the local Biodiversity Records Centre, as well as entering my BeeWalk data so I am keeping last week’s resolution. One of the joys of recording nature is that you are constantly discovering new things. During the BeeWalk this month we found a long-horned beetle that I’d not seen before, last month was my first Mother Shipton moth. 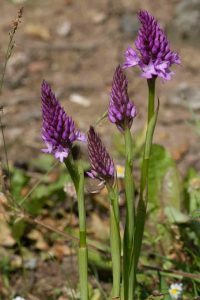 On Monday I was quite excited to discover that there were quite a lot of bee orchids flowering in Daventry (for once the mowers hadn’t done for them) and, quite unexpectedly I found a pyramidal orchid next to them. I am reliably informed that this might be the first record for this in the Daventry area. 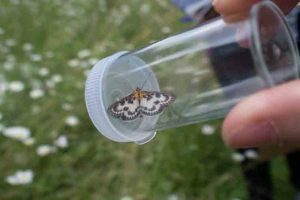 Then, during the recording session at Mill Park Nature Reserve in Long Buckby, I found a small magpie moth. Completely new for me, and although quite common in the county, still something to get excited about I think. And, the more you look, the more you learn and then the more closely you look. A virtuous naturing circle. My next task is to start making a full list of the species I have seen and then keep it up to date! Posted on June 17, 2018 Categories Local Patch, Nature, Wildlife SurveysTags Nature, wildlife recording, WildSideLeave a comment on Some firsts for me.